Though the historical pavilions of the Venice Biennale are concentrated around the Giardini, some countries take over the palaces of the City and it is Massimiliano Gioni who is responsible for the exhibition at the Arsenal. The Venice Biennale is also nearly fifty collateral events and two “Lions”: the gold was awarded to Tino Sehgal and the silver to Camille Henrot. 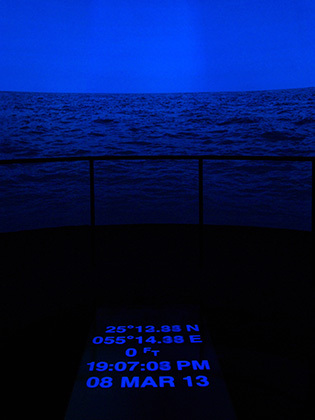 Anri Sala represented France in the German Pavilion in the Giardini following an exchange between the two countries. His work entitled “Ravel Ravel Unravel”, features the concerto for left hand that Ravel composed for Paul Witgenstein whose right arm was amputated during World War I. 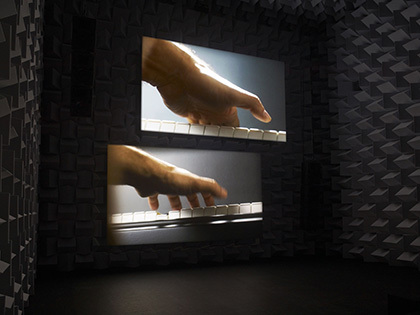 The two superimposed video sequences in the main room, which appears to be an aniconic space, focuses on the left hands of two different pianists. They seem to follow one another, then surpass each other to come together again while the right arms remain passive, almost lifeless, as though amputated by the music. At times it seems the hands reach beyond to go from one screen to the other, while the music envelops the entire space. The two choreographies respond to the orchestra, which from time to time drowns them out. And then, coming from all sides, there are the video images of DJ Chloé that try to synchronise or unravel the two recordings. Multiple dialogues enhanced by the music going from hand to hand, to the hands of the orchestras, and then through vinyl records under the hands of Chloé, intermingle. The United Arab Emirates have a new Pavilion in the Arsenal that Mohammed Kazem has invested with “Direction”. This is an immersive installation, which is not very common in Venice. One enters the half-light to go towards what seems to be the prow of a ship. And all around, there is only water for as far as one can see in the image of the circular video. The line of the horizon appears to be animated by a gentle rolling that the body senses without really noticing it. Consequently, it is the image that works on our senses before our intellect is even engaged. There are works that are destined for the spirit while others directly address the body. But on the floor, there are some GPS coordinates that remind us of the incessant orbits of the myriad military and commercial satellites all around the planet. The most extreme solitude, even beyond maritime borders, seems like an illusion, whereas it is so pleasant to abandon one’s body to the image controlling it, offering it the aesthetic experience of a sensory work. The Vatican now has its own Pavilion where it is presenting the Milanese collective, Studio Azzurro through an interactive installation that is, once again, rather rare in Venice. And it works quite well as the spectators communicate freely with those in the projected images. Touching the supports placed against the walls of this former ammunitions room amounts to entering into contact with the full-size beings that reside therein. Those on the one side are hearing impaired and so start to mime the living, while those on the other side are in detention and evoke their ancestors. All of them are in a way cut off from the outside world. As for the installation, which is on the floor, it represents an ephemeral memory that takes the most recent exchanges into account by extending them a bit. A hand detaches from the image and the one that inhabits it, withdraws until the next dialogue. The gestures are slow and the flow of spectators, ordinarily hurried by the extent of the artistic offerings, are here somewhat less hurried. Venice is where Vatican City has taken up with the art of its time once again. The main exhibition of the Arsenal is called “Palazzo Enciclopedico” and presents a few resolutely contemporary video installations. There are, notably, those of Ryan Trecartin whose work done in collaboration with Lizzie Fitch can be found at the Punta della Dogana. Their lounge spaces, which look like reconstructed apartments, invite the spectator to sit down. The audio headsets that are offered make it possible to isolate oneself as one withdraws from the world to watch the uninterrupted flow of YouTubers. Everything then is a matter of staging, right through to the sequences that are video projected where everyone is made up and overplays their role, evoking the world of reality TV where the only thing that is real is the name. The work of Fitch & Trecartin is a consequence of participative Internet, of up-and-coming celebrities that trend watchers refer to as “Post Internet”. Still, it is difficult to tear oneself away from the flow of scenes that follow one upon the other, without beginning or end, and one has to admit that it is essential questions such as those of genre, among others, that are being addressed in a roundabout way. Eastern Congo”, 2012, Courtesy Jack Shainman. The Irish Pavilion where we find the photographs and videos of Richard Mosse is near the Palazzo Grassi. 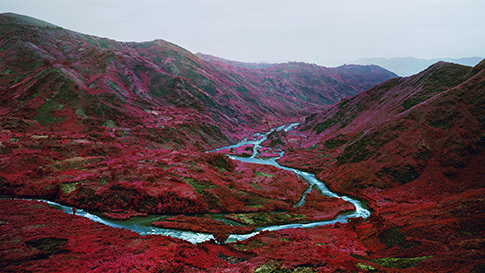 The exhibition’s title is “The Enclave” and the views that are presented there were taken in the Democratic Republic of the Congo with infrared film initially used by the American army to detect camouflage during the Second World War. This procedure, which has been artistically diverted from its original use, reveals chlorophyll that infrared light reflects particularly well. So the landscapes are saturated with colours ranging from fushia to scarlet, This striking natural world, magnified by the photographer’s regard in the first room, does not manage to make us forget the armed battles we witness in the video sequences in the adjacent room, where young soldiers voluntarily enlist for the ‘game’ of war. Here, all the shades of red evoke only the blood spilled by the millions of dead that can be directly or indirectly ascribed to armed battles, which are as hidden from the sight of the rich countries as infrared rays are from human sight. There are collateral events in Venice like the “Noise” exhibition, which brings together a few artists and collectives right next to the Fondation Prada. This was conceived by the exhibition curators Bruno Barsanti and Alessandro Carrer and communicates around the notion of noise in all its forms. 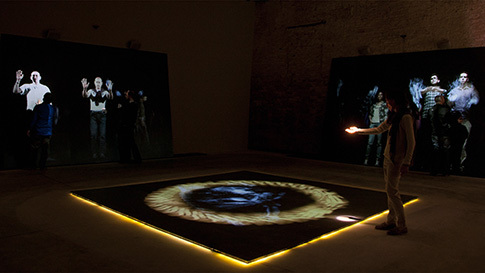 In the work “Post-Digital Mirror” by Pascal Dombis, it is noise in the image that is being addressed. His mirror, which in truth is not, seems however to reflect as many worlds as there are points of view in the space. The work is unique but the spectator multiplies it infinitely through their movements. In the procedure of lenticular printing that the artist has appropriated, it is error that holds our attention. 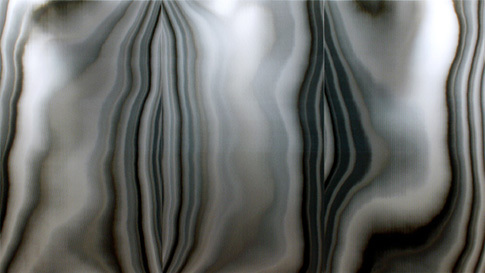 A part of the error is assumed that one finds frequently in the artist’s work and that he obtains here by saturating his support with monochromatic layers of black and white. This piece, in which the kinetic will be recognised by everyone, is also post digital as its monstration is posterior to the procedure, which itself is digital. Within the exhibition space, it is its pictorial dimension that intrigues the spectator, whose relationship with the work is highly elastic. ORLAN, who expresses herself in the upper case, is also on exhibition in Venice within “The metamorphoses of the virtual”, at the Officina delle Zattere where the three bodies featured in the large format video projection are in the image of the artist herself, in cut-away. ORLAN, without the least bit of skin, practices what could be choreography with the slowness of her very first performance, which consisted of going form one spot to another in the city of Saint-Etienne, as slowly as possible. As for the gestures she makes in the three-dimensional space of the image, they re-enact the measurement of streets, squares and monuments with her body, again, as the only unit of measurement. The emptiness of the background, though perfectly black, unfolds to the rhythm of slow-motion body movements that counter the very high speed of the machine calculations that follow on to sculpt all the muscles, flesh, veins and veinules of the model’s body, beyond its own nakedness. In “Liberty”, it is the independence of the artist and of woman, in cut-away, that she is celebrating. Lastly, on San Giorgio Maggiore Island, there is the one-man show of Marc Quinn at the Giorgio Cini Foundation. Here we see the most recent mould of the artist’s head. Just like for the four earlier moulds, this one also required more than five litres of his own blood. It is in this manner that he sees himself getting older, which inevitably makes us think of Rembrandt, whose self-portraits betray the actions of time on the painter’s face. But the head is “living”, if we consider the frozen blood of which it is made. It is written in “The Life of Saint Denis” that Denis de Paris, after having been decapitated, walked for several kilometres with his head under his arm to offer it to a woman before collapsing in Montmartre. 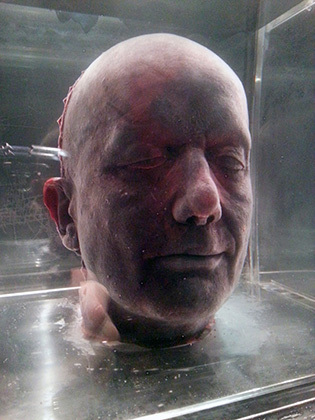 As for Marc Quinn’s heads of blood, they are for sale. We can then, at this 55th Venice Biennale, observe the cut-away of the artist, ORLAN, or the decapitated head of another, Marc Quinn, and this while they’re still alive. The drawing together of art and science, or technology, is more than ever one of the components of contemporary art. Written by Dominique Moulon for Digitalarti and translated by Geoffrey Finch, July 2013.